Any man or woman you hire will come on board with a measure of uncertainty. They’ll step in wondering just what kind of commitment they can expect from you, and many will wonder if they can measure up to the standards on your team. Commitment is a foundational requirement for loyalty, and loyalty for trust. When you help them come up to speed with the technical standards, and give them a leg up on gaining social acceptance of your team, you’ll build a strong foundation of commitment. But even when you fill those gaps and help them gain organizational traction, many will still carry self-doubts. When those situations flare, your words will further their confidence like nothing else can. I learned that lesson as a new fighter pilot taking my first steps into one of the most unforgiving environments in the world – my first operational fighter squadron. A little humble pie over Turkey. The weather was bad and our formation of four jets was forced to fly a pretty complicated instrument procedure into our deployed location at the far end of the Mediterranean. While each pilot was flying his own approach, we were also charged with maintaining a position two miles behind the jet in front of us. I took pride in flying a smooth jet, but that afternoon I got caught up in the bevy of tasks, and my usual precision seemed to unravel into out-and-out flailing. I flew one of the worst approaches of my life, weaving left and right of course and it felt like I was moving the throttle continually from stop to stop. I managed to get back on the ground safely, but the effort really made me question my own competence. I was brand new in the unit, trying to establish a little credibility, and those moments of seeming incompetence were weighing heavily on me as we touched down. As soon the van picked up the four of us, the other three pilots jumped into an animated conversation. “I got to tell you boys, that was one of the worst approaches of my life. I was all over the sky and never did settle into a smooth rhythm — It was mighty ugly!” Bill “Blaze” Binger said it so matter-of-factly that his words began to lighten my load. If someone with his experience and reputation could fly a bad approach, then maybe I wasn’t so bad after all. I knew it really was a one-off for me, but if he hadn’t made light of his own performance, that approach would have haunted me for weeks. That night, I thought back on the fact that Blaze had been right behind me throughout the approach. He could have seen my every bob, weave, and change in airspeed with his radar, but there wasn’t even a hint of sarcasm in his voice. To this day, I don’t know if he was really talking about himself, or if he was trying to let me know that even the best fall short every now and then. When your own standards are high, even small failures can seem disproportionate, whether you’re looking at yourself or at someone else. If Blaze’s words were directed at himself, then he set the bar high for honesty. If they were directed at me, he had re-enforced his commitment to my growth by letting me know that everyone has a bad day. Somehow he managed to accomplish both that afternoon. The bed down phase can be an emotional rollercoaster for new hires. Keep an eye out, and chamber of few encouraging words when you see those doubts flare. When you do, you’ll build the kind of commitment in your followers that lasts a lifetime. 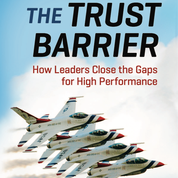 Colonel JV Venable [USAF, Ret], author of Breaking the Trust Barrier: How Leaders Close the Gaps for High Performance, is a Fighter Weapons School graduate who went on to lead the USAF Thunderbirds and combat group of 1,100 American airmen in the Persian Gulf. For more information, please visit http://jvvenable.com/ and connect with JV on Twitter and LinkedIn. Great story JV. It's funny how we can think we've performed so badly and that everyone else has done a bang-up job. Your story reminds us that we don't always see what's going on in front of or behind us. I agree with Joe's comments. It also reminds me of sticky situations that I have been in. You are not always great but as a leader, you do get to live to "fight" another day. Great leadership articles from a number of different perspectives. That's why I am a subscriber. Keep up the good work!